This Italian-spun merino wool is incredibly soft and warm, and a full-cardigan stitch gives this favourite just the right amount of texture. Really cute! Definitely worth it if you buy it on sale. It’s a bit boxy at my regular size, but if I sized down I think the front would be too cropped. I’m usually in between xxs and xs - xxs fit perfectly. Marino wool provides absolute warmth. Got the heather grey - one downside to this colour is that makeup gets on the neck. So comfy and super cute with anything! Jeans or leather leggings ! This is the best sweater of life. I originally bought in the past but accidentally shrank it in the wash and needed a replacement. It's dry cleaning only from now on. I love the size and fit of this sweater! I’m definitely going to get this is in another colour. Cozy and comfy while still looking good. Would buy in more colours if they had them in my size! The fabric is thick and nice and soft, it fits well, not too oversized. I love how it’s longer in the back and shorter in the front, and the sweater goes well with everything! 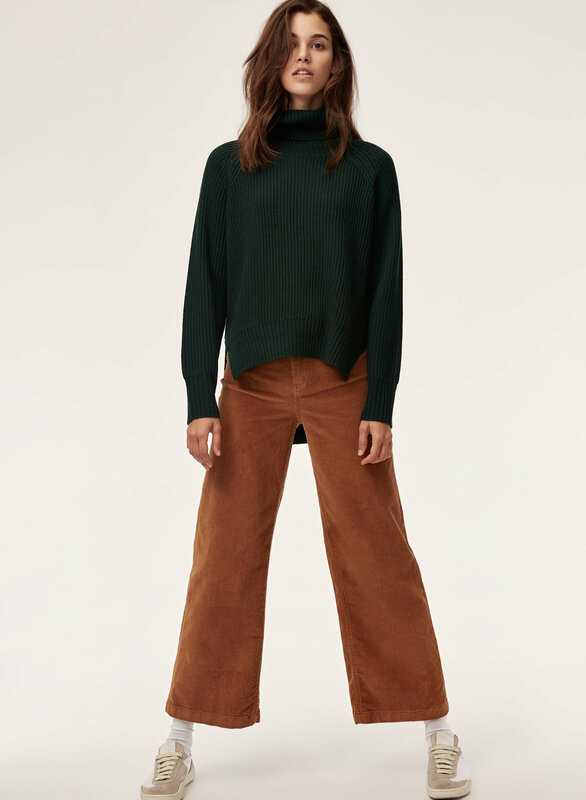 I normally don't like high-low hems, but I find it adds the perfect amount of edge to this otherwise plain, classic sweater. The fabric is soft and drapes really nicely. I can't get enough of this sweater! Even prior to wearing this product I noticed serval loose threads, still impressed with the overall quality. 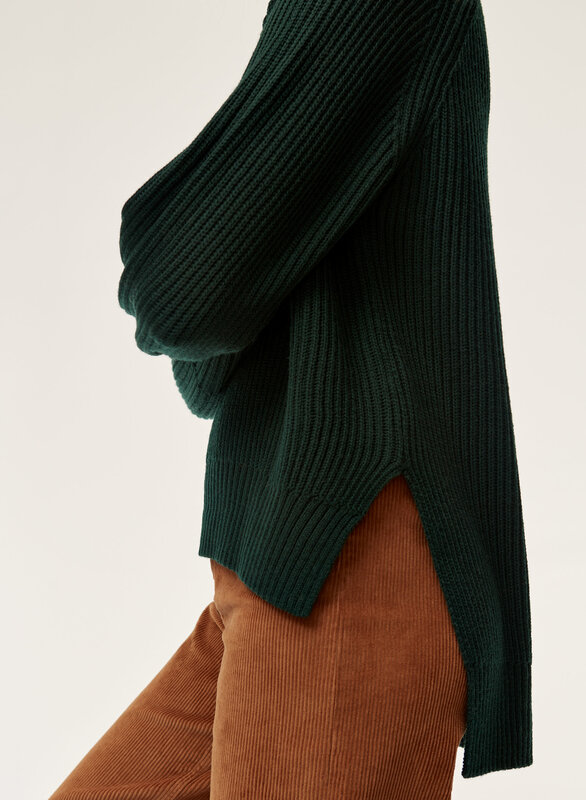 Would love this sweater in other colours! Stunning red colour! Would have preferred to buy this product in the store to check the quality rather than ordering online. Sometimes I feel like you don’t get the best of the best ordering online. Beautiful sweater and I love the silouhette! I ordered the Lin Sweater in Heather Birch...however it’s more light grey than anything else. I have other clothing items in the color heather birch and it’s nothing like heather birch, it’s a solid light grey. 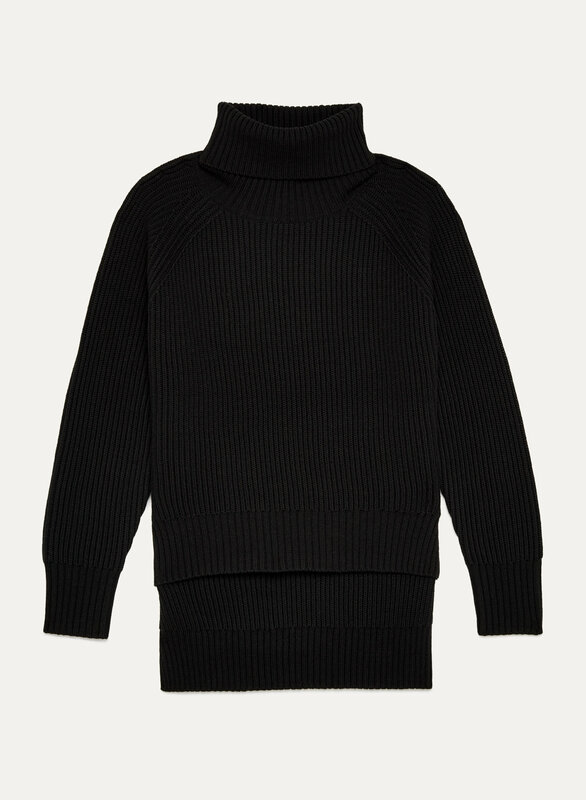 The merino wool form Italy really makes it nice and soft! Disappointed that the color was no where close to heather birch, wanted to do a return but it’s a sale item so out of luck. But nonetheless, still love it. Next time I’ll be a little more careful and not order online. The sleeves are abit too baggy and it fits very lose. Perfect fit and just the right length.one of my faves! This sweater can be worn up or casually. Perfect for spring fall and winter. Great work or casual sweater. Good material. Got the Red, and it is a great color. Love! Got the Medium, and am usually a Medium/Large in sweaters. Very comfy, classy little sweater for everyday or work. The fit is great - I am normally an XS and XS was perfect. Love how the back is a bit longer, making it legging friendly. My friend has the same sweater and had it shrunk in her dryer, so just be careful of that! I have this in two colours and I’m obsessed! I love this sweater! Actually bought a replacement as my last one was getting old but absolutely adore the style & fit. Great for layering with the high and low style of this sweater. Also super warm! 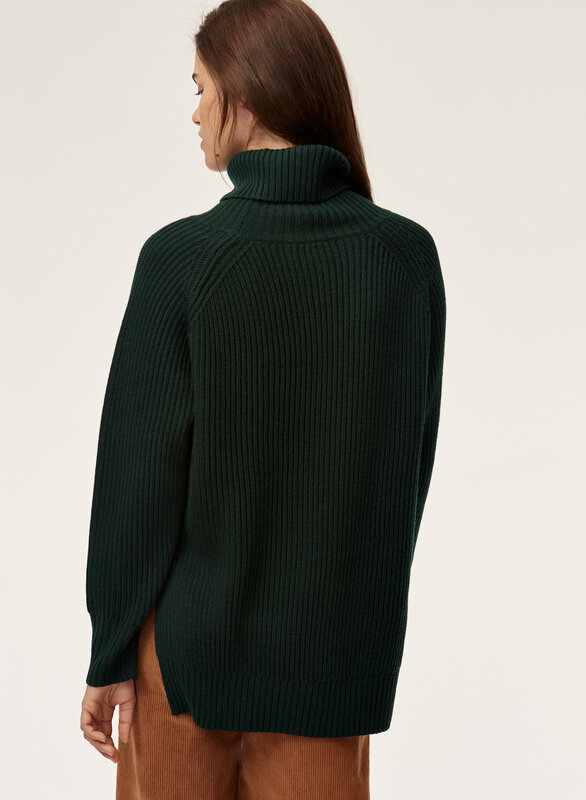 Most perfect turtleneck sweater. It’s so flattering and the longer back makes it so easy to style with anything! Love this sweater, it fits so well and is slightly oversized but not enough to look too baggy. The hi-low hem is so flattering and modern. Yarn is very soft and not too warm. Just bought it in another colour!